Muñoz praises New York trip, but Junta will not pay | Marbella Marbella – Adelante! Marbella Mayor Ángeles Muñoz is calling her promotional trip to New York ‘an unquestionable success’, but even as she is selling the trip to her city and fending off growing criticism, the Junta de Andalucia has said it will not pay for the visit, estimated to cost some 19,000 euros. Speaking at a press conference in Marbella’s tourism office on Tuesday, Muñoz cited the ‘media coverage’ the delegation received, including video of her appearance at NASDAQ shown on major U.S. television networks, as well as agreements ‘in key tourist and institutional’ relations. Marbella was also promoted in a video shown on the giant television screen in Times Square. The mayor said she and the delegation held meetings with the heads of tourism offices and travel publications. Political opponents have widely criticized the visit. The heaviest blow came on Tuesday, with the Junta de Andalucia announcing that it will not foot the bill. Muñoz sought to pay for the trip from the city’s 9-million euro tourism budget, which is funded entirely through the Andalucia Ministry of Tourism. A spokesman for the Junta explained that the tourism ministry will only fund official trips that are approved in advance. The Marbella mayor’s office should have brought a request for funding to the ministry in its meeting during the last quarter of 2009, the spokesman said. The ministry would have assessed the suitability of the trip, but they did not do so because they did not receive a proposal. Of the 19,000 euros, 10,000 covered a New York public relations firm to establish contacts, with the rest going to accommodate the delegation – the mayor, the director of tourism and the director of communications. For her part, Muñoz continues to list what she says are the numerous benefits gained from the trip. ‘It has been a great honour to represent our city in the NASDAQ closing ceremony’, the mayor said during Tuesday’s press conference, ‘especially when Marbella is raising its excellence to an international level’. She added, ‘Four years ago Marbella made news as the most corrupt municipality in Spain, but now we have taken a leap of the first magnitude. I am particularly proud to have been involved with a 180-degree transformation of the city’. 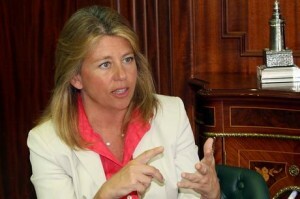 Muñoz lamented the criticism of the trip, directing her comments particularly at the city’s Socialist Party. ‘I am appalled’, she said, ‘at the political blindness of the opposition, and its institutional disloyalty, not with the delegation, but with the city of Marbella, which has now been promoted in a way that many other Spanish cities would like’.